Marvel Studios takes center stage with their second blockbuster film of the summer, Incredible Hulk. This film is not considered a sequel, but rather a reboot of the series. Louis Leterrier directs the Marvel franchise character, Dr. Bruce Banner, who is a fugitive and is in hiding trying to find an antidote to his alter ego, The Hulk. Thunderbolt Ross, the military general, however is still viciously looking for the Hulk and will stop at nothing to drive him out of hiding. Banner/Incredible Hulk is forced out of hiding and faced with decisions that make him control The Hulk to save the fate of New York City from absolute destruction by The Abomination. Edward Norton plays Bruce Banner/Incredible Hulk, this time around and does a fabulous job. His portrayal of Banner goes above and beyond the work Eric Bana did in the previous film, The Hulk. Norton's range of emotion nailed every aspect of the Banner/Hulk character. Edward Norton also wrote a majority of the script, however his writing credits have been excluded from the final product. It was clearly obvious that Edward Norton put evrything he had into this role and it paid off big time with the final product. William Hurt, Liv Tyler, Tim Roth, and Tim Blake Nelson round out the rest of the supporting cast. Surprisingly all do an outstanding job as well. William Hurt gave a standout performance as Thunderbolt Ross. His performance was so good I actually forgot what an oustanding job Sam Elliot had done in the previous film. Sam Elliot was a perfect Thunderbolt Ross, but Hurt delivered just as strong with even more dynamic look at the character. Liv Tyler is beginning to finally catch my eye. I hated her up to watching The Strangers, everything she had done prior, was just to plain for me and always extremely awkward. In this film, she delivers and then some. Tyler as Betty Ross, does not just play the typical damsel in distress role, instead she excels as being the one thing that can help Banner control the rage inside of him and his alter ego The Hulk. Her scenes with the Hulk are very good and she comes off very likable throughout the film. Usually the leading ladies can become very tiresome in comic book films, i.e. Kristen Dunst, Jessica Alba, Jennifer Garner, Eve Mendes, and Kate Bosworth, but Liv Tyler does not disapoint in the slighest in her role. Tim Roth was also very good as the all to eager soldier Emil Blonsky who eventually becomes the monster made famous in the comics, The Abomination. We get to see a few easter eggs with Roth's character because Thunderbolt Ross injects him with the very same "super soldier" serum that made Captain America. Roth does a believable job as the highly ranked soldier who is astonished by the sight of Hulk, and like Ross, will do anything to defeat the Hulk. The action throughout the film is awesome and flawless! HULK SMASH!!! This film does not disapoint at all in action. The final thirty minutes of the film has absolutely amazing fighting sequences that keep you smiling to the finale. The movie moves along at a great pace and does not feel dull or slow. There is a good amount of backstory that comes in flashback form to tie the viewer back into the story. Furthermore, Incredible Hulk was far more accurate with the comic origin of Hulk then the previous film. The cg-animation was very impressive. It was nearly flawless, however in points Hulk just looked a little unrealistic in the environments. I think the green of hulk is a very hard color to render and probably gave animation teams tons of problems trying to give a very real look to the skin and muscle definition. There is an amazing throwback to the"grey hulk" in one scene with Betty Ross and Hulk in a cave, it was breath-taking work! For the amount of screen time Hulk and Abomination get, the cg-animation team did a amazing job. When compared to the last Hulk film, the cg-animation is miles better. 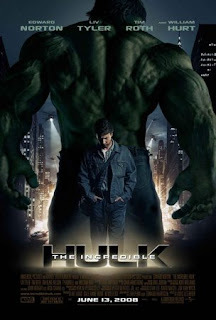 I felt this film was what Marvel intended to do with their first effort, however Ang Lee instead gave a far more intraspective version of the Hulk, which gave it much of its criticism. I still like the Ang Lee version, but Leterrier and Norton nailed it this time around. Incredible Hulk is a complete film that does a great job of dealing with much of what Banner hates of the Hulk and why he realizes he needs to control it, instead of getting rid of the power. The film has an even balance of action, dialogue, and story development and helps add to the overall enjoyment of the film. Leterrier gave plenty of easter eggs which gave true fans of the comic and the casual viewer many smiles and moments of, "look at that!" Overall, Incredible Hulk was great, did it a fantastic job a retelling the Hulk story while developing a new storyarc and setup for sequels and also the Avengers film that Marvel has setup which is sure to be a franchise hit!